Beaducation: The Blog: Bodacious Bangle. New Online class from Kim St. Jean. Bodacious Bangle. New Online class from Kim St. Jean. Don't you love a class that makes you feel like you have really accomplished something? You've gathered simple raw materials and created a beautiful piece of jewelry from them. This class is like that. When Kim St. Jean came to film at the Beaducation studios we were so excited to see this class. She told us Bodacious Bangle is one of her most popular designs and it is easy to see why. What a stunning piece. The simple lines are a perfect background for embellishing, or it looks great just plain and simple. As the launch date drew closer, I started thinking about Kim's technique. She really makes shaping that 6g Copper Wire seem easy. I thought I would give it a try for myself. I wanted to put my own spin on Kim's design. I have really been into I.D. bracelets lately and since we have these great copper blanks, I thought they would be perfect to incorporate into the design. Following Kim's lead, I measured my wrist for the length of the wire and then subtracted the length that the copper blank would add. From there, I just followed her directions for creating the bangle until it was time to rivet it together. I want to point out how important annealing (I used the Max Flame torch to anneal, the Blazer would also work) is to this project. 6-gauge is really heavy wire and it takes a lot of muscle to flatten the ends of the wire so they will be suitable for riveting. I took Kim's advice and stood up while I forged the wire and lacking a heavy forming hammer, I started flattening the ends with a heavy household hammer. The hammer did leave marks on the wire, but it was no big deal as once I had the ends flattened just a bit, I annealed again and moved onto a Chasing Hammer (you could also use the Fretz Planishing Hammer or Fretz Chasing Hammer) which smoothed the ends. The secret to success is anneal early and often. I annealed five times during this stage of the project. After the bangle was formed, I hammered the copper blank with the ball side of the chasing hammer using some of the techniques from Kim's Hammered Textured Metal class. I annealed it and stamped the word "DREAM" using 1/16" High Quality Block Letters on the bottom right-hand corner of the blank. Since the blank already had holes, I used the small (1.6mm) side of the Screw Down Hole Punch to make a hole in each paddled end of the bracelet. I chose that punch since I made my ends a bit thicker than Kim did, and this punch can pierce up to 14-gauge metal. Then instead of riveting with carpet tacks like Kim did, I attached the blank to the bangle with the Mini Screws and Nuts. I threaded Star Brass Rivet Accents on each screw and threaded them through the holes and tightened with the nuts. I cut the extra bit of the end of the screw away with the Fat Daddy Cutter and used the Riveting Hammer to rivet the ends of the screws to keep everything in place. I took advantage of the patina that the torch gave the piece and used steel wool to abrade just a bit away. Then I followed up with a Pro Polish pad and the Sunshine Cloth to give it a final sheen. It looked a bit bare, so I used 6" of 20g Sterling Silver Wire to wrap an accent coil on each side of the bangle near the blank. It was a satisfying feeling working with such sturdy materials and making a unique bracelet. I hope you gain some creative inspiration from Kim's class and come up with some stunning pieces of your own. Choose either the Online Video Class or DVD; you're sure to enjoy creating along with Kim. I sure did. This looks like an amazing class, I love the bangle's heft and rustic nature. Might have to give it a go! I just finished her Hammered Textured Metal class and loved it. She's got a wonderful way of teaching. And you've made this class sound really yummy. Will be checking it out, too. 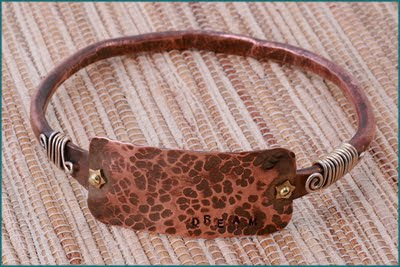 I took the bodacious bangle class with Kim at Bead Fest Santa Fe and I loved every minute of it. I am sure that it will be a good class to take online. Great bangle!!! thanks for the extra tips too! !